In each of 4 slices of bread, cut out eyes, nose and mouth to look like pumpkin face, with paring knife, or cut out letters to spell “boo”; set aside. On remaining 4 slices bread, spread 1 tablespoon of the cream cheese; top with 2 slices ham and 1 slice cheese. Top each with cut bread slice. In 12-inch nonstick skillet, melt 1 tablespoon of the butter over medium-high heat. Place 2 sandwiches, face down, in skillet; cook 1 to 2 minutes or until bread is light brown and cheese is beginning to melt. Turn sandwiches. Reduce heat to medium-low; cook 3 to 4 minutes longer or until bread is light brown and cheese is melted. Repeat with remaining 1 tablespoon butter and 2 sandwiches. 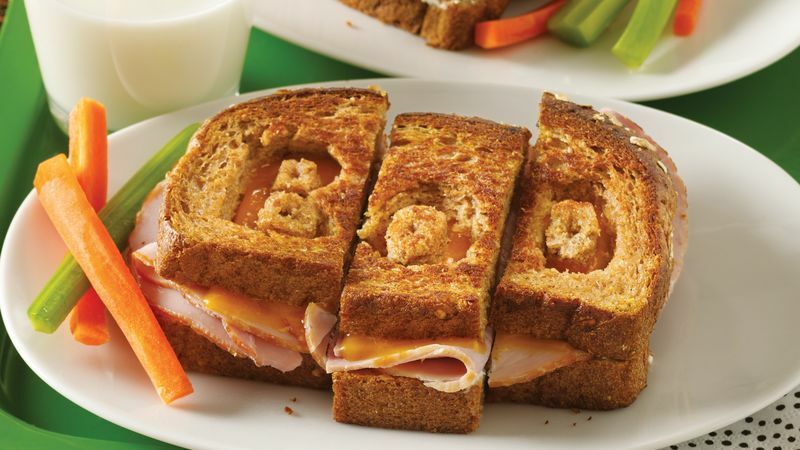 If you have alphabet cookie cutters, cut "BOO" out of 4 slices of bread and cut each sandwich into thirds. Use an electric or stovetop griddle, and cook sandwiches all at one time.